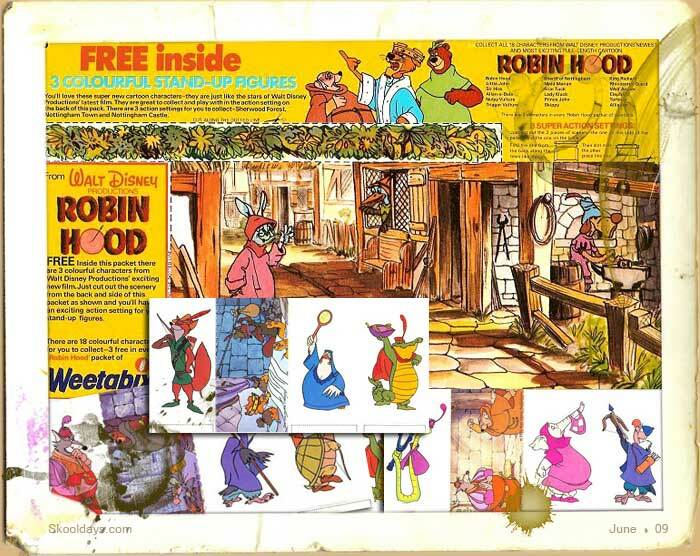 Back in 1974 when Robin Hood was at the cinemas as the latest Walt disney release, kids could collect these great cardboard standups and scenery to act out a scene from the cartoon. This promotion featured a set of card characters and backgrounds printed on the cardboard of the box packaging. The more weetabix the bigger the scene or amount of characters. In the mid-1970s Weetabix ran several other promotions on various themes – all featuring stand-up, card characters and colourful backgrounds with which children could recreate action scenes. As well as the Walt Disney Robin Hood cartoon characters. The other set i remember were Dr Who and the Cybermen and also the Asterix cartoon characters. This entry was posted in Cartoon, Movies and tagged 1970 by Skooldays. Bookmark the permalink. were the knights you mentioned coloured plastic figurines? Great site does anyone know which cereal company ran the dinasour cut outs on the back in the 80s i think it was ready brek .